February | 2018 | Mothers Against Wind Turbines Inc.
Windlectric impacts to roads on Amherst Island. The company building a wind energy project on Amherst Island has been issued a stop-work order by Loyalist Township. The order was issued last weekend and was confirmed again in a letter from the township to Windlectric Inc. on Thursday. Heavy construction vehicles had caused significant damage to haul routes, including deep ruts on South Shore Road, Lower Forty Foot Road and sections of Front Road. The road use agreement between the company and the municipality allows the township engineer to stop work if damage to the roads leaves them unsafe for the general public to travel upon. The order can be lifted once the roadways are repaired. “The Township has a legal and moral duty to protect the public and must act accordingly,” Maddocks wrote…. Sir: Our illustrious mayor spoke on a local radio station recently responding to the opinion poll, in which the number one local concern was wind turbines and water wells concerns. His conclusion, in essence, was that they were not involved except for taking $1,575,000 in taxes from the 450 turbines with an average tax rate of about $3500 each per year. I wonder how much taxes would be for an industrial plant that would have been built and cost approximately $2 million to build. Did the mayor, council and administration ever think that there might be a cost to this extra income? Did they ever consider using this money to do a thorough investigation of the effect on the aquifer? Did they ever go to see the difficulties experienced by those families living off water tanks, especially in the recent freezing weather? Apparently, mayor, council and administration for Chatham-Kent are willing to trade rural water wells for that price. The people losing their wells must prove that there is a problem and then the municipality may look at a solution. The mayor says that they take concerns seriously. That is the exact same B.S. statement made by Premier Wynne when she was in Chatham a couple of months ago and the mayor was looking over her shoulder. No one in government, provincially or municipally, has done anything constructive for years; when the first complaints were lodged in Dover Township in about 2009 and again in 2012. If a bank is robbed, does the bank have to find the criminal and prove his guilt? Isn’t that what police do? If you are in a car accident caused by another person, do you have to pursue and prove the guilt of the offender? Isn’t that what police do? For every injustice, there is a third party whose duty it is to find the perpetrator and proof for the case against them. Since these third parties are no longer doing their jobs, are we reverting to the law of the old west? In the case of the harm done to water wells and the standard of living for those with now contaminated wells, these agencies are not acting in the offended parties’ interests. There are many directions that fingers can point. The provincial government, with its Green Energy Act, which is being used as an excuse by everyone as a document that overrules every other law in the land. This is not true as the health and safety of the citizens of this province still rule supreme, if our Ministry of Health, and local public health unit would get off their backsides and study health effects of the Kettle Point Black Shale that infiltrated our water wells. I believe that somewhere in their health education process they were made aware that lead, mercury, arsenic and uranium are not to be used as vitamins. Why have they never run any comprehensive tests to find out what is in the water now and what are the health effects of those contaminants? The Ministry of Environment and Climate Change is certainly the ministry that is supposed to protect the citizens of this province from anything that environmentally has a negative effect on the enjoyment and use of property, be that by health effects or any other source of irritation. The trouble with the MOECC is that it is the same ministry that issued the permits to build wind farms and are certainly not going to admit that they did not do “due diligence” before issuing these permits. Were there any studies done on possible problems with the style of foundations used in an aquifer sensitive area? Then we get to our local mayor, council and administration. What have they done other than become shareholders in wind farms? Do they value the rural wells of Chatham-Kent at $1.5 million per year? Are they going to use this money to replace the water supply that has been lost by several known residents in the former Dover and Chatham Townships? Are there other townships that lost their wells as well, even before the wind companies went to the pile driving method from spread foot of securing foundations? Was our local government blinded by the visions of a cash windfall without any expense? 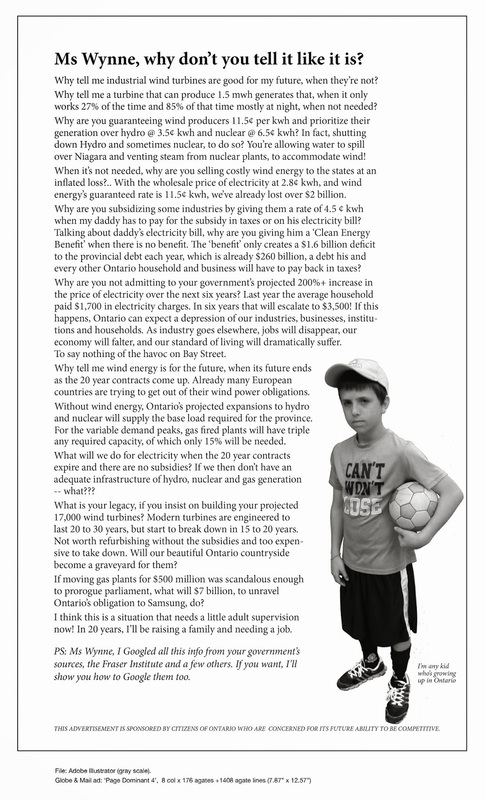 ~How much money was paid by the wind industry to individuals, political parties and the Ontario government for the privilege of building turbines in Ontario without interference? ~How much money was paid by the wind industry to individuals, and the municipality to become friendly hosts for turbine construction? ~How much money would it take to stop construction and operation of turbines until their negative impact on environment issues, especially water, are properly assessed by an independent party, since our politicians, local and provincial, obviously have not done “due diligence” prior to signing agreements? Where can these questions be answered? Are elected representatives not supposed to answer to their constituents? I read in Monday’s Chatham Daily News online that the provincial environment ministry states that the turbine construction has not had a negative affect on water wells. This is despite the fact that residents were encouraged to have baseline water tests to compare with post-construction water quality. There are many wells that have had a long history of good water quality that were negatively affected at the time of or shortly after construction of the turbines as shown by water analysis post construction. This has become too common to be a coincidence. It seems that the ministry is relying on the “science” that existed prior to this project to make their conclusion that there could be no effect on water wells. Perhaps they should look at the reality that exists today and do the work to figure out why there is a clear effect on many wells. They have that responsibility ­– it is clearly stated in the terms of reference of this project that any negative affect on water wells must be dealt with. It is time for the ministry to fulfill their responsibility and hold the wind company to those terms. Until that time they investigate fully why there is damage to residents’ water source and work towards a solution that serves local residents, the information they are spreading reminds me of the droppings of male cattle. Grassroots organization Water Wells First is calling for a health hazard investigation at the North Kent Wind turbine site. In a recent report, the Ministry of Environment and Climate Change says that well water contamination in the North Kent area was not caused by turbine construction. Spokesperson for Water Wells First Kevin Jakubec says this sets two precedents. Families whose wells are affected were provided with water tanks, but now that the MOECC has said the developers are not at fault, those tanks will be taken away. Jessica Brooks, who lives outside Dresden, says she’s not sure what to do now. “We really don’t know. We have to start pricing out [a water tank]. We’ll contact the water company we’re currently working with to see how much it costs to keep that tank. I’m sure we can’t afford it,” says Jessica. The MOECC’s report, which Brooks and several other affected residents received recently, was presented to the media at a press conference this afternoon. “I think honestly, I was surprised at how shocked and devastated I was. I think part of me was hoping my government would step up and do the right thing,” says Brooks. Brooks’ well started showing black sediment last summer.